Callum Davidson scored his first goals for 18 months as Preston twice came from behind to earn a draw at Cardiff. 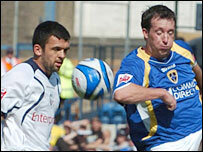 The defender trumped a brace from Robbie Fowler as the ex-Liverpool man opened his Cardiff account. Fowler headed home Joe Ledley's cross at the back post, but Davidson replied with a fine 20-yard left-foot volley. A second Fowler header, from a corner, put Cardiff ahead again, but in injury time Davidson smashed home through a crowd after a clever free-kick move. Cardiff, who have yet to win at home this season, suffered another blow soon after as influential centre back Roger Johnson was stretchered off with a neck injury. Fortunately the defender recovered in the dressing room and there should be no lasting effect. "They scored from two wonder strikes but we shouldn't have allowed them to happen. "Although we are lightweight in the centre of defence at the moment, we should still have been good enough. "You are always worried that a set play could do you and defensively there are still things we must work on." "We are very pleased to come away with a point but I think we deserved it. "The point gives us something to build on and in those final few minutes we even felt we could go on to win. "We practised free-kicks yesterday (Friday) and it is very rewarding when all the hard work on the training field comes off during a match." Cardiff: Oakes, Capaldi, McNaughton, Johnson, Ledley, Parry (Gunter 46), Rae, McPhail, Sinclair (Whittingham 75), Fowler (Thompson 81), Hasselbaink. Subs Not Used: Turnbull, Blake. Preston: Lonergan, Hill (Lewis Neal 77), Mawene, Chilvers, Davidson, Sedgwick, Carter, Jones, Nicholls, Agyemang (Hawley 57), Gallagher (Mellor 68). Subs Not Used: Chris Neal, St. Ledger. Ref: Andy Hall (W Midlands).